Karen and I headed over to Stewart’s Brew Pub in Bear, DE for their 12th Anniversary party. The main theme for the party was that Stewart’s was going to rock out with 12 Barleywines. Before we arrived at Stewart’s I wanted to stop by Garret’s house so that I could try our almost one year old barleywine on tap. 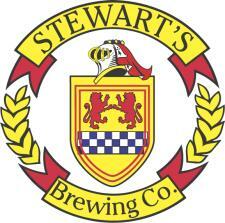 Not only would I get to try a draft variation but I could also compare ours to all of the ones Stewart’s would have. Garret has split his half of the Gnarleywine into two half sized kegs. One keg he left alone and let the beer age, the other keg he added oak wood chips that had been soaked in bourbon. The Gnarleywine at Garret’s from the kegerator is basically the same as what I have in bottles, except his is carbonated and mine is well, not. I thought the flavor and aroma were as expected and the carbonation did help the mouthfeel. I hadn’t had one in a few months and was really surprised at how hot the Gnarleywine still seemed. He then brought up a taste of the Boubonized Gnarleywine and though the keg seemed to have lost pressure and lost carbonation I thought it was incredible. I thought the oak and bourbon notes really tied together the hotness that the Gnarleywine had so that it seemed more appropriate. I think the BGNW is where it is at. After Garret’s we headed on over to Stewart’s. It was pretty busy, but not obnoxiouly so. We decided to order the 12 barleywine flight so that we could sample them all. They had 4 vintages from Stewart’s and 8 guest barleywines. My favorites were Sierra Nevada’s Bigfoot and most of the Stewart’s vintages and Karen’s was the Young’s Old Nick from England. We also picked up some sandwiches while we were there. After the barleywines and dinner I wound up talking to an old friend I hadn’t seen in like 10 years, Wyatt Creswell, while enjoying one of Stewart’s delicious American Brown Ales. Very hoppy (in a good way) for an American Brown yet still rich and malty – nice. Overall I’d say the Stewart’s 12th Anniversary party was a success. I need to remember to check out some of their other events. This entry was posted on Monday, July 30th, 2007 at 12:21 pm	and is filed under Side Trip. You can follow any responses to this entry through the RSS 2.0 feed. You can leave a response, or trackback from your own site.